IT’S all very well producing a Vauxhall Vectra with 255bhp and a top speed in excess of 160mph, but where on earth are you going to unleash all of that potential? 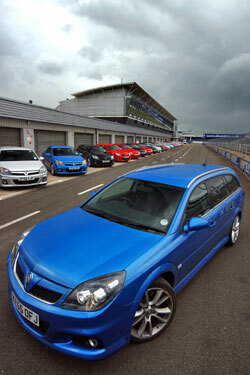 Well, Silverstone circuit in Northamptonshire seems like a suitable place, bearing in mind it is one of the fastest tracks in the UK – and, by happy coincidence, this is where I find myself and our long-term VXR estate. We’ve been invited along by Vauxhall’s brand manager – fleet, Paul Adler, along with around 100 potential buyers to sample the range of high-performance VXRs on track. It seemed churlish to refuse such an offer. With its long straights and wide surfaces, Silverstone can mask the sensation of speed, but such is the oomph on offer from the VXR’s turbocharged 2.8-litre V6 that this is never the case. Approaching the upper end of the V6’s rev range in sixth makes that 161mph top speed seem very believeable, but what is more impressive is the Vectra’s surefooted stance – unlike its more scrabbly Astra stablemate. On the road the Vectra is afflicted by torque steer, such is the force of 255bhp trying to exert its power, but Silverstone’s smooth surface means this is never an issue. The Vectra found many fans among the 700 drivers and fleet managers who attended the series of four trackdays (others were held at Oulton Park, Brands Hatch and Thruxton), with several orders placed for VXRs. While the smaller Astra VXR is the most popular model, thanks to its performance/pound ratio, the Vectra appeals to drivers who appreciate performance without the sacrifices on comfort. And that performance is about to get even better with an uprated Vectra VXR with 280bhp on the cards. Can’t wait to get that model on track.